Male Mallard striking a pose. (At Central Park West.) Notice the yellow bill. Female Mallard stepping out (at Central Park West.) Notice bill is orange with black on the top surface. Mallards are the most common duck in the world. They are the ancestor of all domestic ducks with the exception of the Muscovy Duck. Because of this fact, Mallards cross breed with domestic ducks and some subspecies of the Mallard are in danger of disappearing due to Mallard cross breeding. The male Mallard is a handsome fellow and does attract a lot of female ducks. Promenading at Huntington Beach's Central Park. Mallard ducks are dabbling ducks. Dabbling ducks use their bills to filter water and food. They also tip upside down and their heads disappear beneath the water as they nibble on aquatic plants growing on the bottom of marshes, estuaries, streams, and wetlands of all kinds. All remains above water are a lot of feathery fannies. Every once in a while dabbling ducks come up for air. A Mallard Couple Huntington Central Park. And another Mallard couple at Tewinkle Park in Costa Mesa. Mallards also eat seed, larvae, aquatic invertebrates, grain, insects, and plants. They quack loudly and can be aggressive with other ducks and each other. They are often on the grass by the water, and free handouts from people cause ducks to come swimming, running, and flying to get in on the free bread. Popular male mallard at Huntington Central Park. You will often find Mallards mixing with American Wigeon and American Coots at neighborhood parks. Several species of dabbling ducks in wilderness areas or marshes tend to congregate in mixed groups while feeding. Yet in spite of the gregarious nature of ducks, many of the "Park-Ducks" you see are actually domestic breeds of ducks and not just Mallard hybrids. Some of them look pretty "accidental," but they were bred that way. Very large female Mallard in the front and a very large male Mallard in the back. Near Alice's in Huntington Central Park. A few years ago I began to notice large Mallards mixed in with the others at parks. One yahoo poster noticed them, too, and wrote in to ask what the deal was with the "Freakishly Large Mallards." He's a big fella. (Right lower corner.) Huntington Central Park. I have called them "Baby Hughie Mallards", "Radiated Mallards," and "Mallards on Steroids." Above and below several photos of "Freakishly Large Mallards." (I really like that phrase the best.) These are not optical illusions. These birds really are that big. Large Male Mallard hybrid tells little female, "Stay out of my way, Pee Wee." Huntington Central Park. So what is the story? Is it as one responder to the "Freakishly Large Mallard" post thought: Just a hormone problem? Or as another thought: Too many free lunches? I think the most reasonable answer I have heard is that they are domestic ducks. Either hybrids of Mallards and large domestic ducks or escaped Rouen ducks. Rouen ducks are domestic ducks that have Mallard Markings. They are very large. Some people say domestic ducks have a way of escaping or being released by some breeders when they don't meet breed standards. I don't know if they escaped or were released, but they are showing up all over the parks in LA and Orange Counties and beyond. The Green-headed wonder. Huntington Central Park. Crested Duck at Lake Balboa in the San Fernando Valley. A very odd duck. Recently, I have seen some birds that have a weird growth on their heads. I thought it was a tumor or some awful disfiguring disease. But no. It is actually a crested type of duck bred to look like that. They show up in the park especially it seems when their bobble crest thingy is off center or otherwise falling short of the mark for the breed. And there are other ducks, as I have mentioned, sporting patterns or shapes that seem to be "mutts," but really are members of a specific duck breed. Go figure. Do a search for "Crested Ducks" or "Crested Rouens." Check out the links under "Strange-Looking "Mallard-like Ducks." You will see some strange looking ducks. Also see my posts on Odd Ducks and Wild Ducks of Orange County. Male Mallard on the left in eclipse plumage and one on the right in breeding plumage. Ducks have what's called eclipse plumage usually in the summer. Eclipse plumage is the plumage they have as they molt and lose their breeding plumage. Then the breeding plumage grows back with new fresh feathers. 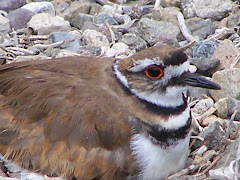 Notice that the male and female look very similar at this time of year. Compare below. Female Mallard. She has an orange bill with black on the top surface. So how do you tell the difference? First, the bill. Male Mallards have yellowish bills with a black spot on the tip of the bill, but otherwise not a lot of black on the top surface. 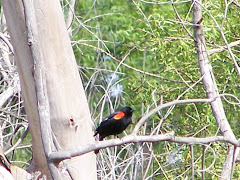 But the female has an orange bill with a lot of black on the top surface. Also the male may have some residual green specks left on his head, and a more chestnut-colored chest. 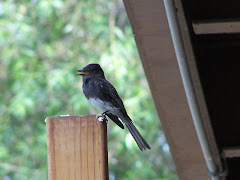 The male also has a bit of a curl in his tail feathers, but it is not always seen in eclipse plumage. Telling the difference between male and female Mallard in the summer is not really so difficult when you know what to look for. They look so cute. Baby Mallards. They usually lay about a dozen eggs. Huntington Central Park East. Mallards are pretty ducks. They seem so simple and yet can be so complex. The most hunted duck, and yet the most common. A species that is so successful that it creates a problem for other species. When you see Mallards, remember the many things about them that make so interesting and make them so much more than "common." 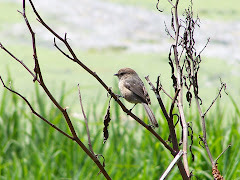 Even common birds can be fascinating as you study their behaviors and become familiar with the species. Don't focus so much on your Life List that you miss out on the beauty of bird behavior. Knowing the behavior and little habits is more than half the fun of birding! Mama and babies. Huntington Central Park on the East side by the Library. So whether you are birding in Orange County in Bolsa Chica Ecological Reserve, San Joaquin Wildlife Sanctuary, or just a community park, if you are near water, watch for the Mallard and remember to stop and watch this common, but interesting bird. 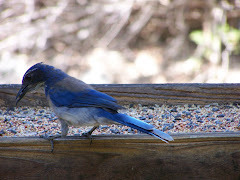 Have fun birding in the OC! 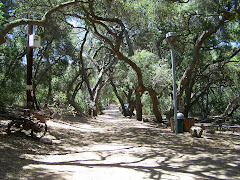 A more natural setting at San Joaquin Wildlife Sanctuary. Good article. Has a link to a short video of a Mallard on the left side. From the Audubon Society. Article on the conservation status of the Mallard. Lots of information. Make sure you read information on both tabs. 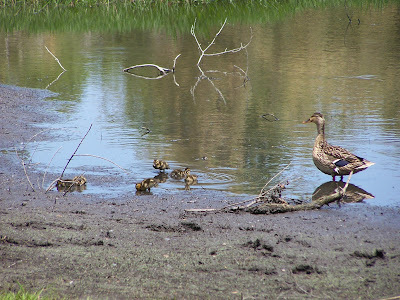 Good article on Mallards and their ducklings and what to do as a home owner with Mallards on your property. 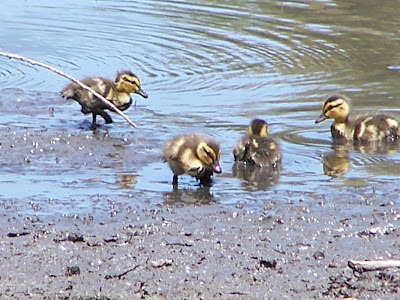 From Orange County's Sea and Sage Audubon Society Website the Article is from a Wetlands Wildlife Care article. New Hampshire Public Television series Nature Works website. This article covers the Mallard very well. Oiseaux.net is a great site with lots of information. It is a French site that has an English version. Good articles, games, and information about birds worldwide. The information comes from ornithologists and naturalists. A study published in the Animal Conservation (1998) 1, 239–244 © 1998 The Zoological Society of London Printed in the United Kingdom. Morton studied the decline of the American Black Duck in Relation to the Mallard in Chesapeake Bay in New York. Some interesting observations. A Study by the Smithsonian's Migratory Bird Center on ducks and neophobia or fear of new things. Complete with videos. Interesting on many levels. From the Audubon Society in Portland.Lots of good information that answers many question people may have about Mallard Ducks. Until I saw this article, I thought ducks like this had some awful disease. We are seeing more and more of them. No, it's not a tumor on the duck's head. These poor ducks are actually bred for this weird bobble on the head. Do a search for Crested Duck and Crested Rouen and see what you find. Odd, but true. Breeders may be releasing the ones who don't have the bobble or crest centered on the top of their heads. Or they may just be escapees. Good article form Cornell about different confusing ducks you may see. Check out these large ducks. They look like incredibly large Mallards. Check out this domestic duck site. Ducks you thought were mutts may turn out to be an actual breed of domestic duck. Collection of free bird videos. Has about 27 Mallard videos. It is always good to study a bird in action. Local park rangers or police may also be informed.